Ever since the kids were born, I often think about their financial futures. I wonder what they will do for a living when they get older, and whether they can build wealth rather than succumbing to the heavily promoted North American consumer lifestyle. I can now see why my parents often tried to nudge me towards medical school as physician jobs are plentiful with well above average salaries. On the other side of the coin, simply having a high paying job sometimes just isn’t good enough. I’m a believer in following your interests as I believe that life is too short to be unhappy with your work on a daily basis. My wife graduated with a professional degree in a health care field that offered a relatively high salary. It was all well at the beginning, but it became less appealing once the kids were born. As her career interest faded, it eventually impacted her overall happiness. So together we made the big decision to leave her professional career behind and figure out how to make it work financially on one government salary. At the end of the day, I want my future adult children to be self sufficient with full filling work. On the way to becoming self sufficient, I believe in post-secondary education. Which is why we have committed to maximizing our family RESP (what is an RESP?) on an annual basis to help pay for their undergraduate degrees. But what about the scenario where RESPs are maxed out and you want to do more? One strategy that I’m contemplating is opening an informal in-trust investment account for each of the kids, putting a lump sum in there, and indexing the portfolio to be used for a big future event. For example, the down payment on their first home, their wedding, or maybe a trip to see the world. Or perhaps if the portfolio grows large enough, it can provide a small stream of income for life. late 60’s, the portfolio would be worth almost $187k in todays dolllars. Of course, there are tax consequences of investing on behalf of your children in a non-registered in-trust account. To get straight to the point, any dividends/interest generated by the account are taxed to the contributor (ie. in my case, I would take the tax hit – not great). However, capital gains are taxed in the hands of the beneficiary (ie. the children – bonus!). With capital gains taxed in the hands of minors, this would result in very little tax in most situations. Having explained the tax consequences, the ideal hands-off tax efficient portfolio would be a diversified indexed portfolio with minimal dividends/interest. While most index ETFs have distributions, there are some specialty swap-based index ETFs that pay no distributions, thus enabling he investor to pay capital gains tax only when selling. Unfortunately, they do not have an international equity product, but I suspect that they are working on one. As for asset allocation, due to the long investment time frame, I would personally keep the bond allocation to a minimum. Perhaps a split of 45% HXS/ 45% HXT/ 10% HBB. Here are some discount brokers that have preferred pricing on trading ETFs. I heard a Warren Buffett quote one time that summarized his thoughts on leaving a lot of money to his children that resonated with me. Having said that, I don’t believe there’s any harm with helping young adult children with many of the big financial milestones that occur early in life. Perhaps starting a tax efficient indexed portfolio now could help offset some of those big upcoming expenses. Now what we do with our growing early-retirement portfolio when we pass away is a topic for another discussion. What are your thoughts on starting an investment account for children? I’m with RBC DI, and am happy with all the funds, except the international fund – are there any other mutual fund options that track – MSCI EAFE Total Return Index that are no load and available for purchase within RBC DI? I’m actually strongly considering opening an RESP with Mower and moving all funds; Anyone own any Mower Funds??? I don’t think it’s a bad idea, but I wouldn’t tell the kids the money exists. It should be a huge surprise, rather than a known given, which might affect their drive to save or be frugal. Same think with RESPs. I’d probably tell them that they can count on some money, but will have to come up with the rest (even if there’s enough to cover the whole thing). Then have give them an unexpected balloon payment at the end. That’s a good point! I must admit that my daughter knows that there is a fund for her education, but as to how much will likely remain a mystery until she gets closer to University (10 years away). There may be a balance to this. I was gifted $10K when I was 10 or 12 and had it in a mutual fund which I watched it grow and learnt a little about investing. It was useful to be comfortable in holding onto that money through the years and not touching it (didnt burn it up buying a car or furniture or something that depreciates). I think I transferred that money to an RRSP for a rebate and then withdrew it to buy our first house (home buyers plan). I have opened Computershare accounts in trust for both my kids to teach them about investing and money. This is separate from RESP for education. In the event they don’t use the RESP, it will get rolled up in my RRSP due to tax implication. The reason for the Computershare accounts is to enable them to see how investing work slowly … Teach them that money saved today can grow to a lot more in the future. There is an incentive in that I match what they invest as well so it increases their desire to save. The purpose of the process is not to leave them an inheritance but rather to teach them about the two concepts: saving & investing. I will also add that both my kids receive a regular allowance and that one is to teach them to spend. It’s not tied to chores or anything like that. Nobody pays me to do chores, our kids have chores too and they don’t get paid to do them. The money is to teach them to spend. Every now and again, my youngest gives me her bank card and says keep it for a while, I don’t want to spend money. 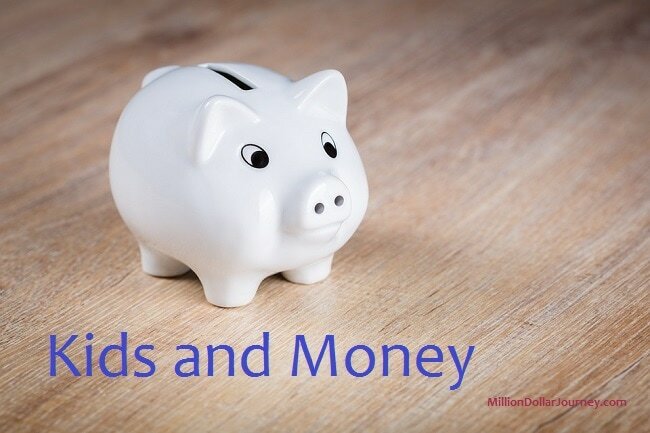 When it comes to money, the earlier you learn to spend (need vs want), save (long term planning) and invest (make your money work), the faster you can have good personal finances. I think I see a solution: pay them a regular allowance, and then have them pay you for doing chores :) Or they can do it themselves instead of paying you. Everyone wins! Richard, that is genius! Have you tried to implement this strategy? Hi Richard, i’m interested in hearing about your counter-intuitive parenting tips – do share! There are no tax consequences to you if you take the child tax credit that the govt is gjving and invest it for them. It needs to go into a special account with their name on it. and then it can be invested as you want. I did this with my kids. I called it their education fund. In the begining I only got $25 but it went into shares for DRIPS, and later into the RESP plan, and into their orthodontist bills etc. Whenever there was something special, they would hear..ok it will come from the education fund. I did their tax returns and declared the dividends in their name. Was audited once and it passed . I am in the process of transferring the DRIPS to them now as the youngest is 20. They will each get around $20,000 .. Now it is their decisions what to do with it but they have all said they want to leave it as it is. I had heard about using child benefits to re-invest without tax consequences, but didn’t know about the actual mechanics on how to do so. Thanks for the tip! HXS and HBB have reasonable MERs, but TER is pretty high (0.30% in case of HXS). I wonder if using some cheaper alternative (like, VFV) and paying taxes on distributed income would result in better outcome. VFV: $10,000 invested with 1.53% yield = $153/year. I assume that since this represents the SP500, the dividends would not be eligible for the dividend tax credit. In Ontario, someone in a higher tax bracket would pay about 50% tax, or $76.50 in tax. This would add 0.0765% to your costs. With VFV having a MER of 0.08%, this would result in an overall MER of 0.1565%. This would vary based on your salary and province. Overall appears like it’s lower cost to go this VFV route (save $15/year on $10k), but you would need to report another T5 slip. I have begun modestly saving (late, unfortunately), but not necessarily investing yet, for my grandkids (without their knowledge or their parents’) with long term goal(s) in mind—we’ll decide when the time is right to give it to them. I’m thinking post-secondary education, a wedding gift, or a modest contribution towards a down payment. My goal is to have $10,000 for each. Seems like a noble idea, to me at least. I wish I’d started when they were born and I wouldn’t be playing catch-up. I’d soon like to start exploring TD Index Funds with the savings. Good on you for looking out for your grand kids. They will certainly appreciate it when the time comes that you give them their gift. I hope so….But kids, being kids, that remains to be seen. Who knows what the future holds? Do you plan to file T3s for the informal trust? I looked into setting up informal trusts in the past, but from what I could tell, the CRA doesn’t differentiate between informal and formal trusts so you have all the same reporting requirements. Some great comments here! Most importantly, teach your kids about money and finance from a young age. I think that is more valuable than leaving them a large trust fund. That Warren Buffett quote is spot on. He rightly knows that a large windfall to his kids will ruin them. I really admire Warren Buffett. He manages a multi-billion dollar business, but I think he still lives in the same modest house he bought in the 1950s! We have a young toddler now, but I plan to have regular discussions with him about money and finance in the future. Even something simple like showing your kids this website and discussing its content, can be a useful learning tool! Hope is when they are .. ~12 (?) they start asking about the money. Give them the envelopes let them add it all up. Then show them the value of their account. Make it a teachable moment. Sometimes I wonder about how much it really helps to give large gifts. If they use it to get a bigger house or a newer car is it helping them? If they can’t afford it without the gift is it a good choice? I would think that something that has a clear long-term benefit like education is a bit different. Aside from that I’d like to come up with ways to help make things easier (and avoid major disasters) without taking away their independence. A really interesting idea I heard was to give some bonus every month that’s proportional to their working income so they have more reason to work for it. Helping to invest or even giving a high interest rate would also encourage good habits. Another option might be to let them choose between receiving an income from the portfolio (say 5 – 10% per year) or letting it grow, so it’s enough to help but not enough to live on. But at some point if they are independent they will need to make larger decisions. If you’re going to give it all to them eventually this could be done in larger steps as time goes on. I opened a seperate TFSA in my name for my daughter. She helps me with a weekly cleaning job, and I pay her, but take half of it and put it into the TFSA. I told her to pretend I am the tax man, so she will be used to not getting the full amount she earns when she has a real job. I buy dividend paying stocks for her, so one day she will be able to see the value of investing compared to laboring for money. Hello! I was wondering what your thoughts were on The equitable Life Insurance Company of Canada. A financial planner thinks it’s a good idea to get whole life insurance policies for our three children, each $100,000 policies. Is this a good idea? I know this doesn’t necessary pertain to their education future however it is still in regards to their future and I’m really struggling to know if this is a good path to take. I am definitely not a financial expert like some of you in here, I’m a stay at home mom trying to make the right decisions for my kids. Any insight would be appreciated! Arlene, I would generally avoid whole life insurance policies for children – unless they have a condition that may impact insurability in the future. In my mind, insurance is financial protection against a worst case scenario. With your children not generating any income, does it make sense to insure them? Personally, I would avoid. My parents took whole life insurance on my kids for $50K each paid over 10 years. It was a way for them to help us and the reality is that while they don’t have income to protect, a funeral cost money with all the arrangements needed. So it was a way to potentially help us and it’s money the kids could access in the future. I would have preferred that they contribute to the RESP account or create an account in trust based on what I know now. Thank you two for taking time to respond. I think the financial planner is trying to look at this as it will be beneficial if something does happen to the kids unexpectedly (their passing) and to have the insurance there for expenses but also she is thinking it may be useful for them for the future. We will be paying $1500/yr per child for twenty years. After that we no longer have to pay into the policy and the policy itself keeps growing and compounding. If they don’t touch it all their life and they go to retire they will each have around one million dollars to use. I just dont know if these whole life insurance policies are legit or if they should be avoided? The growth of money is always great to hear and it’s a great sale techniques but ask yourself how it would perform if you were to just buy an index fund with that money. The $1,500 per year that you put aside for them can do the same thing while you retain control of the money. As mentioned, I would have preferred something different like an investment. Look into computershare and invest the money in trust. So the question is really, do you need coverage in case one of the kids pass away? The more likely scenario is if the kids live a long time, by that point, you are really giving the benefit to your childs spouse/your grand children. And when your advisor says that they’ll have $1M for retirement, that isn’t entirely accurate. There will be a balance in the policy but your child will only be able to BORROW against that amount rather than simply withdraw from it. It can basically be collateral for a bank loan. If it was me, I would invest in their education (RESP) first. If you’ve already done that, I think that an in-trust investment account depositing $1500/year for 20 years would be a better bet.